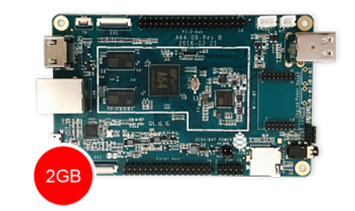 ROKOS v7 "Core" for Pine64+ IoT Devices Released. Full Bitcoin OK Clients, nodes and much more. Faster, Easier, Stronger. We've seen new services selling "stake miners" or pi "fullnodes" for different amounts of bitcoin ranging from 200 USD to 982 USD, we support the new technology and uses for cryptocurrencies in the Raspberry Pi , Bananapi, Pine64+ and IoT environments, hence we came up with a Free solution for every IoT enthusiast, developer, user, service that want to use their IoT devices with Bitcoin and OK, or that would like to turn their Pi into a Staking device, It already integrates a fully functional Bitcoin Client and full node as well to provide the users with the best and easier Out of the Box experience, and to be the perfect toolbox for developers. 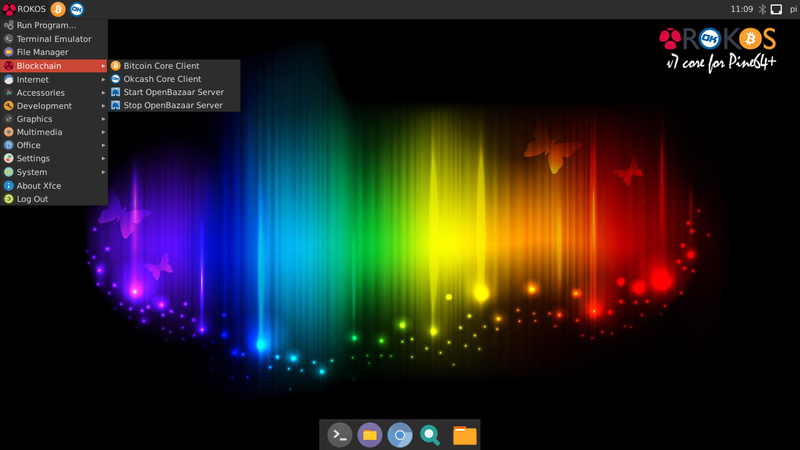 - ROKOS v7 "core" comes with integrated OK and Bitcoin Client / node and OpenBazaar server. ROKOS v7 core for Raspberry Pi zero, 2, 3, and BananaPi coming up. 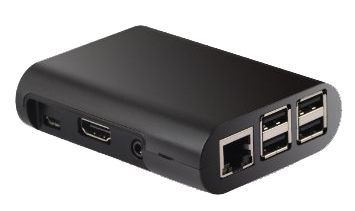 - Full burnable OS Compatible with the Raspberry Pi, Pine64+, BananaPi and IoT devices. - Updated Bitcoin client / node v0.13.0 with full functionality. - Updated OKCash client / node v4.0.0.1 with full Stake functionality, private messages. - ZIP file - Compression: 2.2 Gb image to download (Pine64+). - Min 16gb SD card and an External device (usb / hdd / ssd). To sync the BTC chain on the external device instead of the SD card, BTC chain alone is around 60gb. 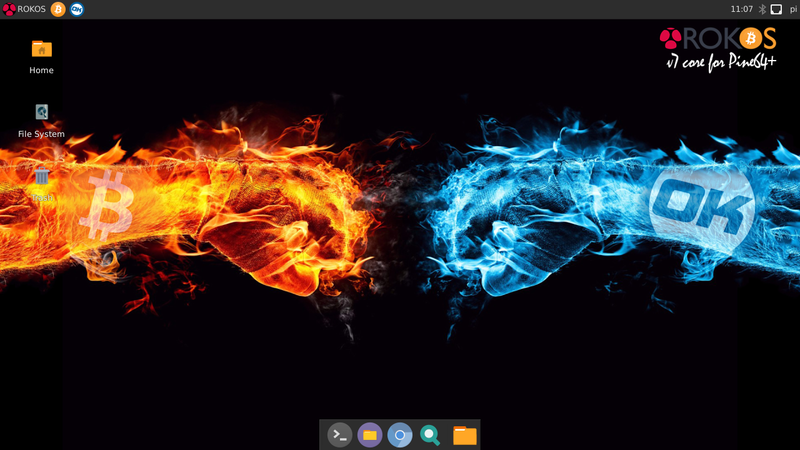 a) Login and open a terminal. This will open the Bitcoin wallet with the option to select where we will be saving the BTC chain. 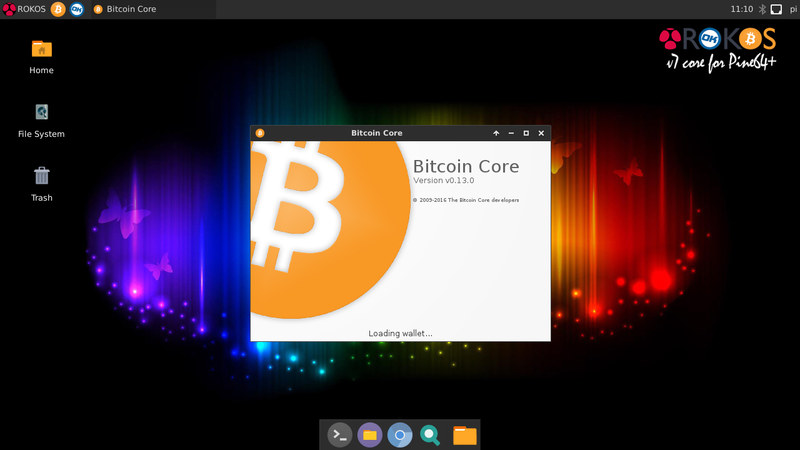 *For BTC the initial sync will take some days, wallets are fully usable after being fully Synchronized. You should ALWAYS have a backup of your wallet, Pine64+, Raspberry Pi and IoT Hardware, Debian and ROKOS Software are under development hence not responsible for missuses, electrical or compatibility issues that might cause a loss of information. It is as secure as one's ability to take care for it, same as a computer, so always have a backup of your wallets on an external device. *) Some people tend to recommend getting a 128Gb MicroSD HC (High speed) , at the same time it does work, We do not recommend this solution, as microSD cards tend to get corrupted by the number of overwrites, to ensure the best functionality and security you should use an external HDD/USB storage device to store the chain. You can start testing and developing new integration with the Bitcoin and OK Tech for your IoT projects. 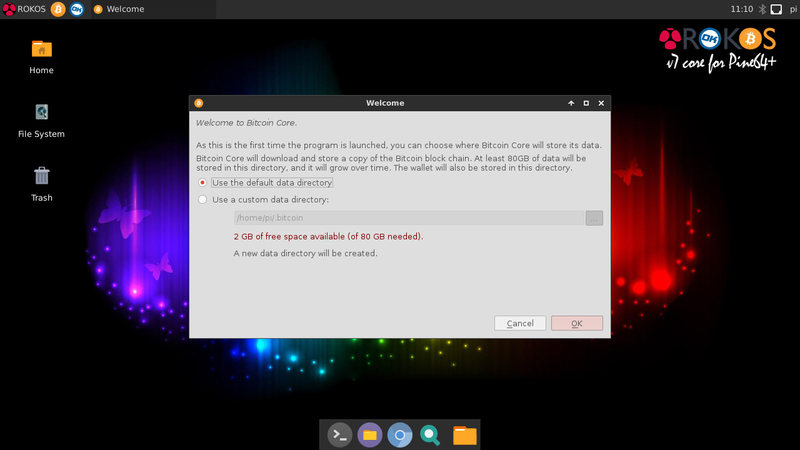 Bitcoin Client on ROKOS v7 "core"
I'm sorry, but what exactly is this? 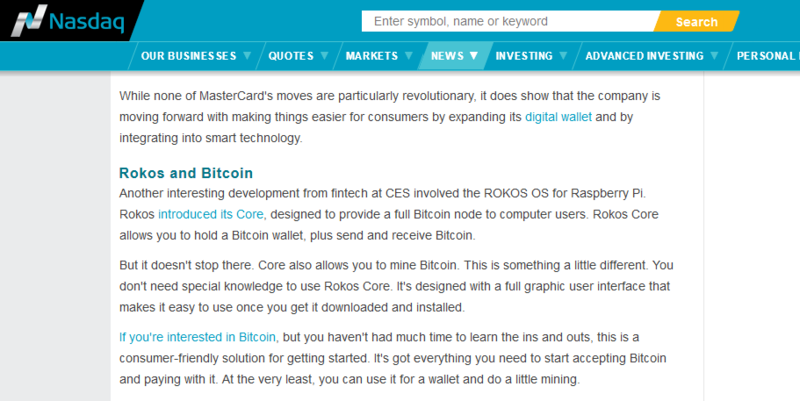 there are 2 versions: ROKOS core (the one shared here) with the included BTC, OK and openbazaar among the rest of described features. and ROKOS flavors (which includes more than 13 cryptocurrencies) is getting released in the coming weeks. Here is an article for the pi release, good news is now there's ROKOS for Pine64+ as well. Thanks, I know nothing about bitcoin. Have a nice day, I'm sure somebody will appreciate your hard work. 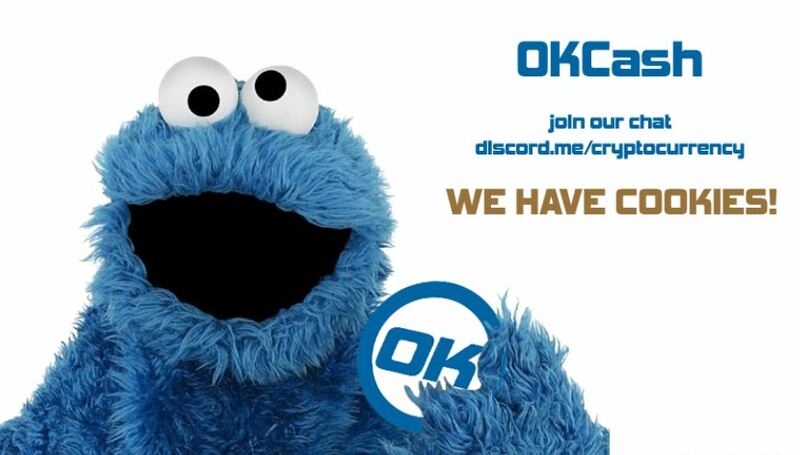 and see how easy it is to use, send and receive OK coins. I'm running a full bitcoin node on Pine64 and Rokos, super stable. (11-05-2016, 02:06 AM)souspeed Wrote: [ -> ] I'm running a full bitcoin node on Pine64 and Rokos, super stable. A pleasure. Thank you for your feedback! where there's the special #helpme channel for support.